The image below may look like the illustration for a vintage science fiction movie, an astronaut transfixed by an alien sun on a desolate planet. But no, it’s just another day on Earth. Frankly, it sometimes feels like we don’t deserve this world and its myriad wonders. 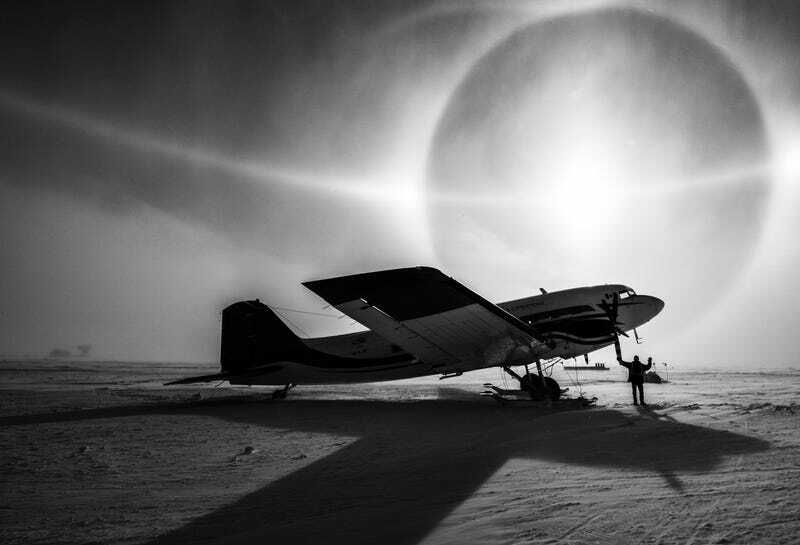 Photojournalist Christopher Michel’s took the cinematic picture on a recent trip to Antarctica. 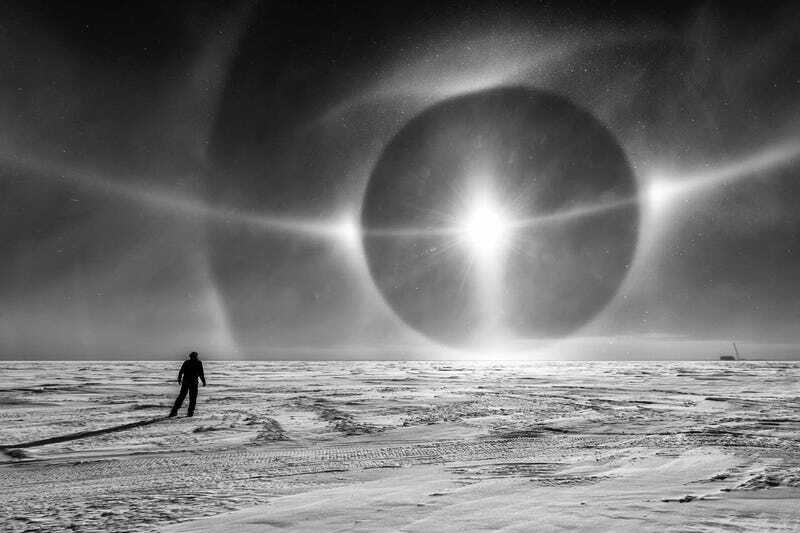 He snapped the photo just under a kilometer from the South Pole while out on the ice with Antarctic Logistics and Expeditions, a company that helps with science and tourism visits during the short Antarctic summer. It’s a place few will visit, which is perhaps why it feels so alien. The sky gives the picture its extraterrestrial quality, but its cause is definitely of this world. The phenomenon is known as a sun dog (or parhelion, if you wanna impress your nerd friends), and it happens when there are ice crystals in the air. Those crystals can occur in cirrus clouds, or in the case of a cold, dry place like Antarctica, they can be suspended in the air near the ground (fun fact: the latter is called diamond dust). The crystals are hexagonal and in shape and tend to float horizontally. In that position, they refract light so that it appears there are two other baby suns flanking the real sun. When crystals are more vertical, they create a halo around the original sun. Clearly, the atmosphere was alive with crystals facing both directions in Michel’s picture. Thank you for your service, ice crystals and sun. If the photo evokes a retro feel, that’s by design. Michel told Earther he was inspired by a photo from 1986 of the first unassisted overland walk to the South Pole. That expedition itself drew inspiration from Robert Falcon Scott’s ill-fated trek to the South Pole in 1912, which saw him and a party of five reach the pole only to perish on their return trek. Michel met Robert Swan, one of the 1986 trekkers, as well as Ghazala Ahmad-Mear, the wife of Roger Mear who was also part of the 1986 group, while out on the ice. Swan and Ahmad-Mear were there to retrace the 700-mile trek to the South Pole.